The Sheaf 1953. Digital image: The Hammer Museum, Los Angeles. Artwork: © Succession Henri Matisse/DACS 2014. 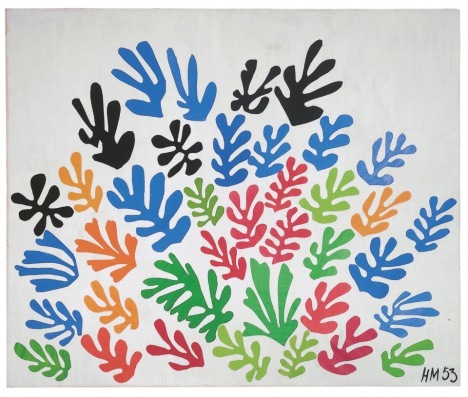 If you haven’t seen the Matisse Cut-Outs show at the Tate Modern yet, don’t miss it! It is on all summer, closing on 7th September. If Modern British Art is your thing, the Dulwich Picture Gallery’s Art and Life show should be on your list; it is a beautiful exhibition focusing on Ben and Winifred Nicholson and curated by their grandson. If you are in the West End, Pilar Ordovas’s Chillida on Miró show is one to see, and the Royal Academy’s Radical Geometry exhibition opening on 5th July is a must. Make a note in your diaries that Freud’s Auerbach collection is coming to London’s Tate Britain from 25th August – you can see it now at Manchester City Art Gallery. And if you’re up north, swing into Tate Liverpool for the Mondrian exhibition, open until 5th October. Auction-wise, you can view both the Impressionist and Contemporary sales at Sotheby’s and Christie’s from tomorrow. Christie’s Modern British Art sale is also on display at King Street ahead of the sale on 25th June. The Old Master sales will be on view at both houses from 5th July. Do let us know if you would like more information on any of the sales.